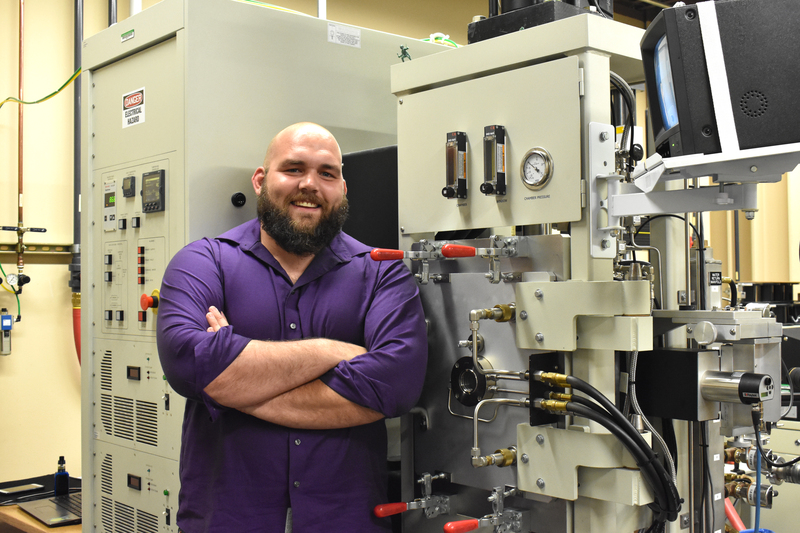 DENTON (UNT), Texas – U.S. Army veteran and University of North Texas junior Kyle Rose is being rewarded for his work on improving military armor. The materials science and engineering student earned the Science, Mathematics and Research for Transformation Scholarship for Service from the U.S. Department of Defense. The SMART scholarship covers full tuition and fees along with an annual stipend ranging from $25,000 to $38,000, health insurance, up to $1,000 for books, a summer internship and employment with the Department of Defense upon graduation. “I chose UNT because I wanted a veteran-friendly state with an engineering department active in research affiliated with the Department of Defense,” said Rose. Through a recently established partnership with the U.S. Army Research Laboratory, Rose has been working on creating different types of ceramics designed to improve the toughness and strength in military armor. “After all his efforts, Kyle really deserves this award. This scholarship provides a fantastic platform for Kyle to apply the knowledge he acquired from both the classroom and military to study current materials-related issues to help U.S. soldiers in combat,” said Thomas Scharf, a materials science and engineering professor and mentor to Rose. Rose, who plans to complete his Bachelor of Science in Materials Science and Engineering in spring 2019, is also a student in UNT’s GradTrack program, which allows students the opportunity to complete a bachelor’s and master’s in the same field within five years. After completing his degrees at UNT, he plans to put his materials science and engineering background to work at the U.S. Army Armament Research, Development and Engineering Center in New Jersey. There, he will be working on certification of manufacturing techniques with the goal of protecting those serving in the armed forces. Prior to attending UNT, Rose spent four years in the U.S. Army as a crew engineer on MH-47G Chinook helicopters.